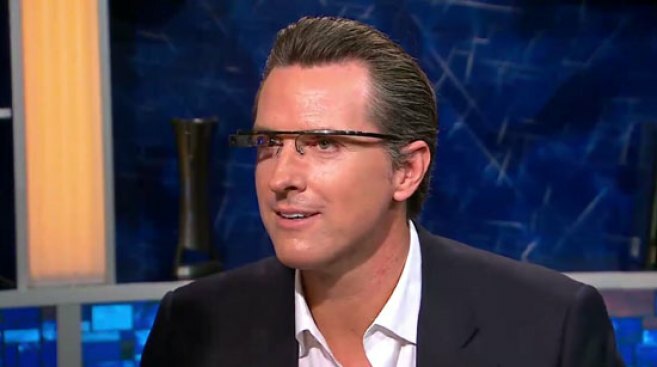 Gavin Newsom likes Google Glass, too, but not on the subway like Google cofounder Sergey Brin. He's still testing it out. In public, on the subway. Google's famous future product prototype "Google Glass" -- the glasses with a heads-up display and powerful portable computing, right at the tips of your eyes -- was out in sight in New York City recently, with Google co-founder Sergey Brin sporting the specs for a ride on the downtown-bound No. 3 train, according to reports. Brooklyn's Noah Zerkin is credited for the scoop and accompanying pic, snapped after he had a "brief conversation" with Brin, according to SiliconBeat.com. Google Glass is "wearable computing," the news source noted, and is still in the planning stages despite a splashy worldwide introduction last year when skydivers wearing the specs used the incorporated video camera to shoot a live feed of their descent from a blimp to a tech conference, the news source reported.